Today as part of the Shudder tour I have a review, excerpt and author sponsored giveaway to share. Enjoy! Last year I enjoyed Stitch the first book in the Stitch Trilogy and was anxious to discover what was happening in this strange dystopian world. Samantha Durante's second book Shudder shows us the world beyond the walls of Paragon, and the engineers that designed Paragon. She does this all while revealing things that kept me turning the pages. Three word review: fascinating, suspenseful and enlightening. The tale picks up right after Stitch ended as Alessa and Isaac travel the world beyond Paragon looking for a headquarters for the rebels. There is danger and something supernatural pursuing them. As they search Alessa experiences emotions and memories of the dead and the creatures that pursue them. Lizzie is taken captive by the Engineers and we gain insight into their operations. Told from multiple third person perspectives that change with each chapter Durante reveals the characters and the engineers to us creating a suspenseful and fascinating read. Alessa struggles in this novel with her emotions, the visions and the mission. Memories of Joe haunt her and she is unsure why, she loved him but loves Isaac. I like Alessa and find her to be brave and fearless even if she occasionally wants to escape her grueling reality. Isaac is sweet, and does things to protect both Alessa and his family. Phoenix is brave and through her we learn more about the engineers, the past and Paragon. We meet #14 and #15 as they exchange notes through a hole in the prison cells and learn their identity towards the end of the book. While the driving force of this tale is the world itself, I would still like to see the characters fleshed out a bit more. I wasn’t as emotionally invested in them this time around. I thought once they became unstitched I would feel more. The engineers *shiver* are diabolic and we are often privy to their plans. We see many of the original rebels and I am hoping they become more fleshed out in book three. I struggled with some of the characters behavior but the author slowly reveals information explaining it and I am anxious to see what develops. While Shudder didn’t suffer from middle book doldrums it didn’t have quite the captivating affect that book one had on me. The author uses Alessa and Isaac in the beginning to recap events from book one through conversation and sadly it felt awkward. Once we got past that bit their conversations and connection felt more natural. While it is not the main focus, we see growth in the romance, despite a few hiccups. We have a several storylines running parallel to each other. The first is Alessa and Isaac as they travel outside Paragon. The second is Phoenix with the engineers and the third is the prisoners in the cells below Paragon. Each thread was interesting and gave us tremendous insight into the world while still maintaining an air of mystery and suspense. I actually like the way this was done, it kept things suspenseful. The tale moved at an even clip until the final chapters where I found myself turning the pages at a frantic pace as all of the threads came together and we moved to the climatic ending. We as the reader are now privy to things the Rebels do not know and the set up for book three created suspense and anticipation. With its powerful world-building this tale has me excited to read the conclusion of this trilogy. Fans of Stitch will find the world-building and events in Shudder fascinating. 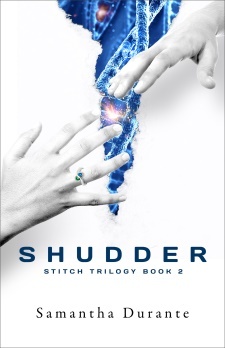 I would recommend the Stitch Trilogy to fans of dystopians with a science-fiction edge to it. Stuck the final book is scheduled to release in 2014. The crunch of broken glass outside the dumpster broke Isaac’s train of thought. Alessa looked up at him with alarm and he just held her tighter in his arms, his ears straining to track the movement of the sound. The noise moved back and forth, back and forth, as if someone were pacing only steps away from the dumpster. Isaac held his breath, his pulse pounding in his ears, his skin crawling with every snap reverberating through the empty dumpster. And then suddenly the noise came faster, like more sets of feet tramping across the pavement in a violent rush. His ears pricked at the intrusion of their snarls and growls, eerily raspy and shrill at the same time. He couldn’t place the sound at all – it was unlike anything he’d ever heard. Squinting in the darkness, he tipped his head back and strained the muscles in his neck, hoping for a glimpse through the crack in the lid of the predators beyond. There was a quick flash as a hulking mass darted past the front of dumpster; Isaac jumped, quelling the gasp at his lips. Alessa convulsed under his arms, her face still buried in the front of his coat. For a moment everything grew quiet. Isaac fought the tingling in his limbs and willed himself a statue, not daring to move or breathe, his senses prickling at the slightest hint. Had the hunters left? The force of whatever had just landed on the lid thundered through the dumpster, the walls and floor ringing with an earthshaking rattle. Isaac and Alessa flinched as one, him bearing down instinctively over her curled, trembling body as the center of the ceiling crumpled inwards under the weight of their attackers. From above their heads, a magnificent piercing howl penetrated their hiding place, resonating off the walls of the hollow enclosure and chilling Isaac to his core. Any sense of security that Isaac had felt was shattered with that nightmarish wail; whatever it was that wanted them was directly above their heads. A series of crashes shook the dumpster from the sides, Isaac and Alessa lurching away from one thunderous bang only to be bombarded from the other side with the next. Another jolt from above and a savage grating snarl sent Isaac jerking to the floor, his eyes wide with terror as he gaped at the buckling ceiling. This was no wolf, and no cougar – this was something far more dangerous. He seized Alessa in his arms and said a silent prayer for mercy. The only thing they could do now was wait to live or die. It is very well written and I totally loved book one and the mystery/.suspense of the world, book two is awesome, I just didn't like the way the recap was done and wanted a little more depth from the main characters. I cannot wait for book three! This is suspenseful and I like that aspect, enjoy! This series sounds fascinating. I love a good dystopia. The excerpt seems fairly well written I will be searching for book one the next time I go looking for books. I recently grabbed a copy of Stitch and hope to start on it very soon; I'm really pleased to see you enjoyed this one despite it not being as captivating as the first - I really like the sound of Alessa and Isaac, hopefully they are further fleshed out in the next book. Yet another series I need to start. It really does sound interesting. I'm pretty sure I already downloaded the first book. I think you would enjoy these Lauren! I love the mystery aspect, hope you enjoy them! Sweet, these are different and have a mystery too them! ooh glad you snagged book one enjoy Cricket! Yeah I love all the suspenseful bits., hope you enjoy them! I am so happy there is a book 2 in this series! The cover is just as cool as book 1's. I love the blue and black. 14 & 15 exchanging notes through the wall sounds pretty cool. I love it when books have those mysterious things going on that keep you guessing. I am anxious for book three! I think I also got the first book when you mentioned it and glad to see that you liked it. I grabbed the first book when it was a freebie because I remember you recommending it. I haven't read a good solid dystopian in awhile and this just sounds creepy. I am happy to hear while this wasn't perfect that it didn't suffer from the second book syndrome! Oh sweet! I do have the first book and now I really want this second book as well. Okay, you also have me curious about the third book! That ending sounds intense. Wow that excerpt was intense! I'm a bit creeped out actually. :-) I really need to read this series, so many trusted bloggers love it. I'm very glad book two hit the mark, even if it didn't totally blow you out of the water. It sounds like the author does a great job of juggling all these storylines and keeping you invested in the series. Great review! I need to purchase the first ebook for my teen so she can read it on her kindle while at camp! I know, it is great that you love them too, makes for fun recommendations! ;) I need to push this one up my TBR pile for sure now. I am anxious to hear your thoughts, since I know you love dystopian worlds as much as I do! I just picked up a copy of Stitch the other day so I am excited that you liked the sequel just as much. this is different and suspenseful hope you enjoy them! I'm always wary to start the second book of a series fearing it might suffer from middle book syndrome. I'm glad to hear that this series is still working for you despite it not being as great as the first book, Kim. And you mentioned the magic words in your review - fascinating world building, so I have to check this series out. Agreed! Thanks so much again for hosting Kim, and thanks to everyone for your interest in the series! I'm reading and reviewing this book next month!! Will have to come back then to compare notes!! You are welcome Denise, I hope you enjoy them and I look forward to the conclusion. It's a good series and I hope ya try it! I really need to squeeze the first book in, so many people I know enjoyed it and this second book sounds promising. great review, Kim.